A burglary takes place about every eighteen seconds in the United States. That adds up to nearly 200 per hour, and approximately 4,800 every day. These are startling statistics, but they highlight the fact that burglary is a crime you need to be aware of. The good news is, the more you learn about burglary, the more effectively you can help protect your home and family. Here are ten surprising facts about burglary—and preventative tips—everyone concerned about home security should know. Based on a report by the University of North Carolina at Charlotte’s Department of Criminal Justice and Criminology, about 60% of convicted burglars stated the presence of a security system influenced their decision to target another home. Preventative Tip: Get a monitored home security system to help reduce the chance of being a burglary victim. Use the yard signs and window stickers you’re provided with to alert potential intruders to your security system. Make sure the signs and stickers are visible from every approach to your home—not just the front entrance. 2. Most burglaries take place between 10:00 a.m. and 3:00 p.m. Contrary to popular belief, the majority of home burglaries take place during daylight hours, not at night. That’s because most people are at work or school—which reduces the chance the burglar will be noticed. Preventative Tip: Install indoor and outdoor motion-activated home security cameras so you can check on your home throughout the day. Plus, you’ll receive an alert if the camera detects motion, so you can evaluate the situation immediately. 3. The majority of break-ins are committed by burglars who live nearby. The typical burglar resides within two miles of the target home. Because they live close, it’s easy for them to learn your family’s daily schedule and strike when they know you’re not home. They may also check for signs that you’re on vacation—such as flyers or newspapers piling up at your door, an un-mowed lawn, or trash cans left at the curb. Preventative Tip: To help minimize the risk of a burglary, vary your routine as much as possible and have someone take care of your home when you’re out of town. 4. Most criminals can burglarize a home in less than ten minutes. 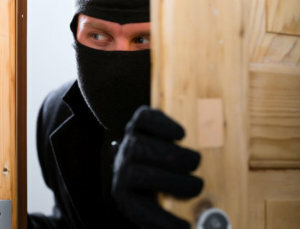 Burglars look for homes that are easy targets. That’s why it doesn’t take long for most intruders to break into a house, get what they want, and take off before being noticed. Preventative Tip: Strengthen your home’s defense by getting a home security system, keeping all entrances closed and locked, and installing a high-quality front door. Then go a step further: join, or form, a neighborhood watch group and use a crime mapping website to keep up-to-date on local crime trends. 5. Almost 30% of burglars enter a home through an unlocked door or window. A surprising number of burglars gain access to homes through open or unlocked entrances. First floor windows and doors are especially well-liked by burglars—particularly when a burglar can be concealed behind overgrown vegetation. Preventative Tip: Keep all entry points closed, locked, and alarmed, even when you’re at home. Make your home less appealing to intruders by keeping shrubs and trees trimmed back. 6. An astonishing 34% of burglars enter through the front door. Preventative Tip: Keep your front door closed and locked at all times. If the door is worn or has a hollow core, replace it with a solid wood or metal door—they’re much harder to break down. To help further fortify your home against a burglar, use a quality knob-in-lock set with a heavy-duty deadbolt, mount a security camera or motion sensor light above the door, and install a smart doorbell. Never give your house key to workers or hide a key outside your home. 7. Burglars usually go to the master bedroom first. Unfortunately, most people don’t hide their valuable items carefully, and burglars know it. Once they break in, burglars head straight for the master bedroom, where they scavenge through dresser drawers and nightstands, look under mattresses, and search closets. Cash, jewelry, and weapons are some of the things a burglar wants most from your home. Preventative Tip: Store your valuables in a safe that’s bolted to the floor, or hide them in unlikely locations. 8. The average property dollar loss per burglary is a staggering $2,251. The price of a home security system pales in comparison to the emotional and monetary cost of a burglary. The FBI reports that burglary victims in 2014 lost a total of $3.9 billion, and nearly 75% of the burgled locations were residential properties. Preventative Tip: There’s a home security solution for almost every budget. You can get a basic home security plan for as little as $20 per month—advanced plans and upgraded equipment may cost more. Getting a monitored security system may also qualify you for a discount on your homeowners insurance policy. 9. Someone is home during nearly three out of every ten burglaries. Coming home to find your material possessions stolen is frightening enough, but victims who are home when the burglary occurs experience even more trauma. According to a crime victimization survey conducted by the U.S. Department of Justice, a household member is present during approximately 28% of burglaries, and 7% of these victims experienced some type of violent crime. Preventative Tip: Make sure to arm your security system even when you’re at home. This will help keep you and anyone else in your home safe. 10. Only 13.6% of burglaries in 2014 resulted in arrests. Typically, burglaries are exceptionally hard crimes to solve. Even if the burglar is found, you may not be reunited with your lost property. Preventative Tip: Due to recent advances in home security solutions, more criminals can be caught on camera. For instance, by using a home security camera with a live video feed, a homeowner in Fairhaven, Massachusetts was able to see that two burglars were inside his home. He immediately contacted police, and the men were arrested at the scene. As a homeowner, you can use a home security solution to put a stop to burglars. These statistics confirm that using a monitored home security system and taking precautions can help protect your family from a burglary. Learn more about the top home security providers, and find one that meets your needs and budget.